There are two central themes running through this accessible, elegant andauthoritative account of early Irish foreign policy. Firstly, that the ambitious rhetoric of pre-1922 Irish nationalists to develop an international and geopolitical rationale for Irish independence was not always matched by the foreign policy of the Irish Free State.The harsh realities of independence and the tragedy of Civil Warsawdreams dashed. Secondly, that despite the shattering of pre-independence hopes,many of the themes of contemporary Irish foreign policy have their roots in the ideas and actions of the statesmen and diplomats who took independent Ireland’s first steps in international relations in the 1920s. While it is often dangerous to ascribe direct connections betweenthe present and the past, many of the tenets of today’s Irish foreign policy are recognisable in the policies of those years. What is fundamentally different, and the difference is alluded to in the final paragraph of the book, is that today’s Ireland is outward-looking and globalised in a manner those managing foreign policy almost a century ago could never have imagined. Today’s Department of Foreign Affairs and Trade, in which Gerard Keown is a serving officer, currently ambassador to Poland, is also a vastly more significant department of state with a greater reach than its 1920s predecessor. What his precursors would have made of our present predicaments we can only speculate; theirs was a different world. Core foreign policy goals were in place by the early1930s.They showed that Ireland had a right and an obligation to play a part in world affairs. ‘Responsible and disinterested’ (p. 128) diplomacy at the League of Nations underpinned a commitment to multilateralism and the rule of international law. The Irish Free State based its foreign policy on human values, not power, and these values were held in the greater interest of the members of the international community, regardless of power or size. But national interest, the traditional realm of foreign relations, was present in ‘the unfinished business of December 1921’ (p. 252). The Irish Free State also needed to loosen the bonds of its unwanted dominion status, and to curtail anti-Treaty and republican fund-raising in the United States;in addition, though it pre-dated the 1921 Treaty, partition remained. Keown shows that 1920s Irish foreign policy was not simply a question of being an international good citizen. Was Ireland ‘the first of the small nations’? Keown concludes that it was not, but that Ireland was, nevertheless, more successful in international relations than its size and resources might have suggested.Keown’s account crosses obvious chronological divides (in particular 1919) and so takes pre- and post-independence as a continuum. 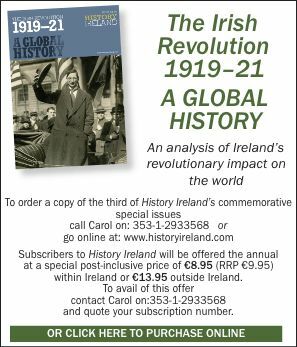 There was no blank page for Ireland’s foreign relations on 6 December 1922, the date the Irish Free State gained international sovereignty; many key concepts were there in embryonic form from the experience of the revolutionary years. 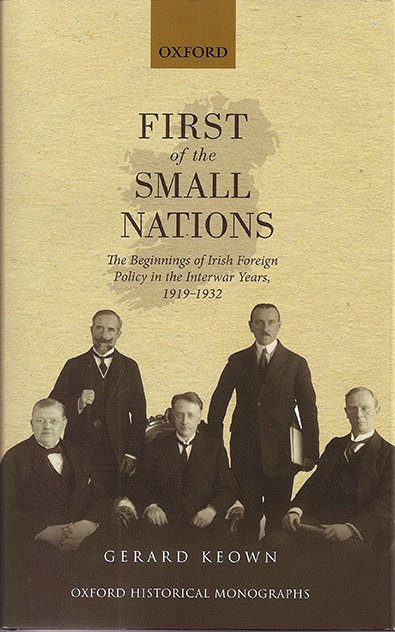 The chapters follow a direction familiar to historians of Irish foreign policy: Dáil Éireann’s foreign policy of propaganda, bluff and fund-raising, the first steps on the world stage in the Commonwealth, the League of Nations and in bilateral relations. This chronological approach is broken down chapter by chapter into two–three-year blocs. These run from imagining Ireland’s place in the world, taking a place on the world stage, seeking security and to the hopes and regrets of the late1920s. Within thesemore-or-less thematic chapters are short, easily digestible accounts of key events and actions and here thematic issue areas of foreign policy are tackled. Covering 1919 to 1932,Keown takes the reader through what maybe familiar ground, yet he charts a new trail across it. The view is different, and the new perspectives are what make this book stand out from previous accounts.Earlier historians of the period, the current reviewer included, were still trying to work out the lie of the land. Keown builds from these foundations and adds a wide variety of new material and insights, particularly on the activities of the Dáil Éireann foreign service. Keown’s own experience is moulded into the text—not explicitly, as he is writing in a personal capacity, but in the overall substance of what he writes. It is a major change in the transparency of the Irish foreign service that a serving diplomat should write such a book. It would have been unthinkable in the 1920s, and it is to the benefit of the reader that the author is so well versed in his tradecraft. He spots the nuances of the diplomatic world that others might miss. Once the current glut of 1916-related material has cleared, one can but hope that the achievements of the state-makers and state-builders of the lateteens and early twenties are also remembered.Readers of this book will be left in no doubt that, despite the failure to gain recognition and the fratricidal split over the 1921 Treaty, itself seen by some as a lowpoint in Irish diplomacy, those who served Ireland overseas in these years had triumphs and successes of which we should be proud.Gerard Keown’s account of Ireland’s initial place amongst the nations and how it got there has shown us ‘how Irish hopes and aspirations of an international voice developed’ (p. 2).He shows how in foreign relations ‘the wider difficulties caused by the transition to independence’ (p. 148) were transcended. The book admirably succeeds in its aim of showing how an Irish foreign policy identity emerged and the young Irish state asserted its newfoundinternational status. Michael Kennedy is Executive Editor of the Royal Irish Academy’s Documents on Irish Foreign Policy series.